Police have launched an investigation after a number of shots were fired at a house during an early-morning incident in Co Antrim. Police received a report that a vehicle was hijacked in the Craigy Hill area of Larne in the early hours of this morning (Monday, September 11). Detailing the incident, Detective Chief Inspector Dunny McCubbin said: “Police received a report at approximately 1:50am that two masked males, armed with suspected shotguns, approached the occupants of a Volkswagon Bora that was parked outside a property. The males threatened the occupants before taking the car. 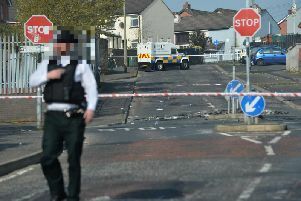 “At approximately 1:58am, police believe the vehicle was driven to a property in the Brustin Brae Road area of Larne where it was set alight outside a garage. Police also received a report that shots were fired at the property. “We are appealing for anyone who was in Craigy Hill area or Brustin Brae area at around these times and noticed any suspicious behaviour, or anyone who knows anything about either of these incidents to contact detectives at Larne Criminal Investigation Branch on the non-emergency number 101, quoting reference 74 11/09/17; 78 11/09/17. Mid and East Antrim District Commander Superintendent Darrin Jones added: “The local community will continue to see an increased police presence in the town to provide reassurance and deter those involved in this feud from engaging in further criminal actions.